I received an email from Shutterfly recently mentioning that they were offering a free 8x8 photobook to all members. Never one to turn down something free, I proceeded to spend the next 12 several hours on Shutterfly's website, creating my photobook while Natalie and Michaela Byrd systematically dismantled the downstairs of our home. I use Shutterfly each November to make photo calendars for all the great-grandparents' Christmas gifts. They have a fabulous deal every year where you buy one calendar at full-price and get each additional calendar for dirt cheap. I stalk the Shutterfly emails all Fall, waiting for the offer. My Nannie thinks that her cleaning lady stole hers, but the rest of the great-grandparents just love opening theirs on Christmas morning. Shutterfly's software to upload photos is relatively simple, and doesn't take too long. The problems I found were when I went to move photos around within my layout. The screen froze several times, and I lost my work. I learned quickly to save the file frequently. Despite Shutterfly's software malfunctions, I am as pleased with my 8x8 photo book as I can be for something I only paid $8.00 (shipping) for. Here's the cover of my new, hard-bound photo book. The black bar over our last name is obviously my Paint handiwork. You can choose different backgrounds for the cover as well. I wanted something fun and summery. My friend L does a (Kodak) photobook for her kids' grandparents each year for Christmas, and she keeps one for herself as a way to document her family's year. I take a lot of pictures, so I found it hard to go through all of my files and choose just the right photos. If you make a book for an upcoming holiday, I suggest starting to file your pictures now! It takes longer than you think to peruse all those files. They have a wide variety of sizes and layouts you can choose for your photos. For a girl who has never tried the whole digital scrapbooking thing, I found it fairly easy to use. I liked that I could change the background paper on each page if I wanted to. I chose to do different coordinating papers on each page. 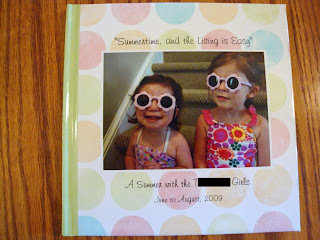 My other beef with Shutterfly is that they make proofing VERY difficult. This set of pages was supposed to be at the end of the book, but somehow ended up a few pages earlier. A few pictures were cut off because the proofing pages are so tiny you can't really see what you're looking at. On the whole, I am happy with the product. The pictures turned out nice and bright, the paper is of good quality, and the cover is thick and sturdy. Not bad for just the price of shipping! If you have the time to create one of these (20 pages is the minimum), they'd make excellent Christmas gifts. I plan on displaying this with the Snapfish photobook I received through the Oprah deal last Fall. Visitors love thumbing through them. Guess I better start going through photos for those calendar gifts if I want them done by December! Go visit Julia at Hooked on Houses to see what everyone else is hooked on this week. 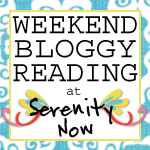 She hosts this fun blog party each week. Thanks, Julia! Your post makes me miss scrapbooking very much! I didn't realize Shutterfly now offers this feature - thank you! I didn't know you could do that. Thanks. Would grandma ever love that. Thanks for the tip. I'll check out Shutterfly. Your book looks great! Your book looks great and your blog is beautiful!! My scrapbooking stuff has lain dormant in the cupboard for over a year.... time to get it out again I think! What a fabulous idea! 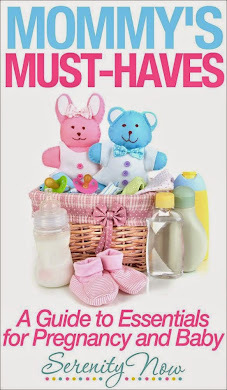 Grandparents will treasure these gifts for years to come. Thanks for sharing! Well, that's just pretty darn AWESOME! How long is that deal going on? I have a shutterfly account, but have not been paying much attention to their emails lately. I HAVE however been mulling over creating a summer album of this sort too. If I can get one for free like you I'd do it in a heartbeat! That book turned out darling! Love the cover you chose - such a happy summery design! I visited Barb, and found you through your comment! Have a great Friday! Hooked on..... hummingbirds this week. I've never done anything like this, but I love it. It would make a great gift for somebody. Maybe I should do one for my parents of their grandkids for Christmas or something. All my pics are stored on shutterfly. Thanks for the info, I didn't get an email about the offer. I love this idea and so wish I had gotten the free card! The idea of calendars for the grandparents is great! Thanks for the hop tip. So cute! I love all the colors and patterns you picked for the pages. Those photobooks are fabulous!! I send them as Christmas presents for grandparents each year!! I love it! I wish I could come look through the whole book...your girls are so adorable. I have some credits with "Heritage Makers" (you can check them out online, beautiful, but kinda pricey) that I need to cash in! I love it Amanda! Great idea! I have heard of Shutterfly but as of yet have not used it myself. I would love to make a few of those little 8x8 photo books. Yours turned out just darling! Thank you for the info. I will go and check it out.